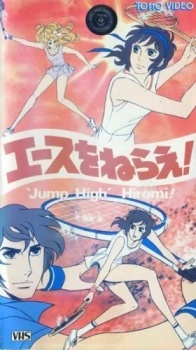 High school freshman Hiromi joins the tennis club because of her admiration for Ryuzaki. Ryuzaki is a senior, who's the best tennis player on the team and also nicknamed "Ochōfujin", ("Madame Butterfly"), because of her elegance on the tennis court. However, the new coach, Jin Munakata, wants the inexperienced Hiromi to play in a forthcoming tournament. Due to this, Hiromi considers quitting tennis for good but, in the depth of her soul, she soon realizes that she loves tennis after all. She returns to the club and, under Munakata's coaching, her talent starts to bloom. In the end, Hiromi develops a strong emotional bond with her coach, not knowing that Munakata is risking his life because of a chronic illness. Watch Ace wo Nerae! (1979) Episodes Online at Animegg.org. Ace wo Nerae! (1979) is available in High Definition only through Animegg.org. Choose an episode below and start watching Ace wo Nerae! (1979) in Subbed & Dubbed HD now.